PVC heating mat system is low build and suitable for tile and stone floors. The PVC heating mat system is ideal for installations within regularly shaped areas, where 0,5m wide mats can be quickly rolled out across the floor in parallel runs. The heating cable is attached through a series of loops to a thin but tough fibreglass mesh for rapid installation. This system is available in a choice of 150 and 200W/m² heat outputs to accommodate different requirements. This system is suitable for all applications, providing primary or secondary heating in all rooms or projects that adheres to building regulations. The dual insulated heating wire is 3 mm thick. Sturdy glass fibre mesh with double sided tape for secure installation. Simply roll out the mat with pre-spaced wire. This product comes with 10 Years Warranty. We are completely confident in the standard of our products. 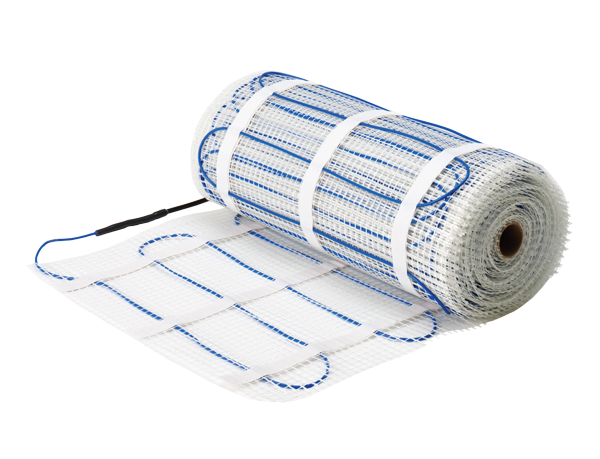 The PVC heating mat can be installed virtually under any floor finish (contact Warmup for additional information), however the system was designed for installation under ceramic or stone tiles. The PVC heating mat is available in 2 different wattages: 150W/m² and 200W/m². As standard the 150W/m² should be used, however in cases where the space to be heated has a high heat loss, the 200W/m² version should be used. Choosing the correct control system is crucial in ensuring that the heating system works in the best possible way, efficiently and easily.